The online world is rapidly growing, and you need to understand how to build your business if you want a place in the market. Whether you’re a solo practitioner in a particular city, have a boutique with several partners, or your firm has a national presence, you’re leaving money on the table if you don’t master your digital marketing. But where do you start when you don’t understand all the marketing jargon, or you don’t have time to learn all the new, ever-changing strategies? It can feel like every week someone new is telling you what you should be doing. Let Shawn Leamon, Chief Strategist at LaGrande Marketing, be your guide. LaGrande Marketing is a boutique digital marketing firm based in Dallas, Texas that provides sophisticated digital marketing solutions to top law firms across the United States and internationally. The content of this book is based on real-world case studies of law firms that have substantially increased their sales and practices by implementing digital marketing the right way. 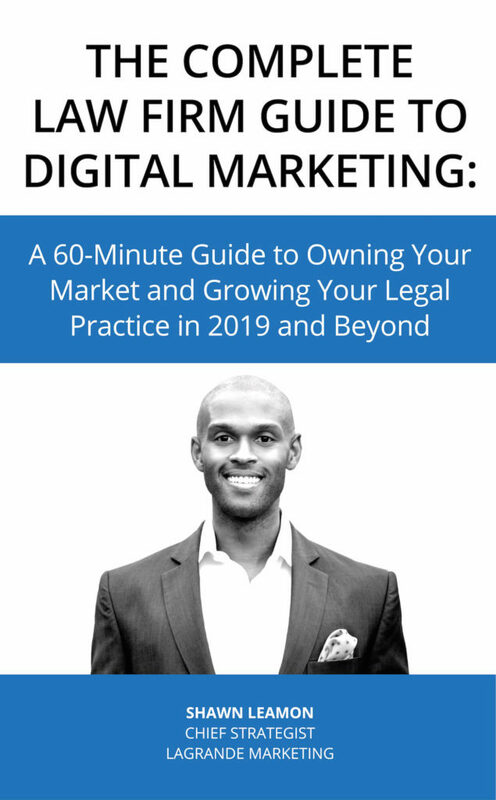 Whether you’re just opening your law firm or you have an established practice, this 60-minute guide will help you see the potential you can create if you implement a marketing plan for business growth. Learn what online marketing strategies less than 1% of firms employ today that can grow your practice and help you thrive—all in under 60 minutes.